Jump And Slide Entertainment now offers……. Long Island Mechanical Bull Rentals…………Yeeee Haw! Looking to rent a Mechanical Bull in Suffolk County? Or Nassau County? Well, it’s here! SAFE AND AFFORDABLE…. All NEW 2016 Deluxe mechanical bull rentals on Long Island. 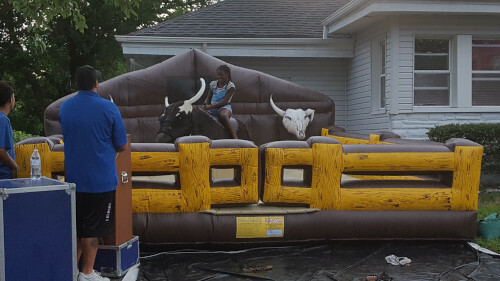 We shopped for the BEST, SAFEST, BIGGEST, Baddest mechanical bull on the market. The mechanical bull rental is made right here in America. The company has been the #1 provider in making mechanical bulls. Our deluxe bull takes you back to the WILD WILD WEST. You will see the detailed art work it on the western corral inflatable we set the bull up on. The console has state of the art controls.Its also housed in an old ammunition style themed case. The control console has a LARGE led clock that lets the trained operator know how long the rider has lasted, while a LARGER LED displays the time of the rider so all the .and the “BEST TIME OF THE DAY” So everyone knows the time to beat! SAFETY Is Paramount! It has 6 automatic programs set at different riding levels and the AUTOMATIC STOP SYSTEM. As soon as the Cowboy or Cowgirl falls off the bull it comes to a complete stop! Our trained operator can use the six different programs or operate it manually with the joystick and different speeds. The speed of the bull is decided upon the rider. Every rider is different on their ability to ride the bull. We can be as gentle as a Calf……Or for the more adventurous or we can adjust it to the full RAGING BULL mode. Our trained operator stars out everybody at a comfortable level and the adjusts as the rider adjusts. The mechanical bull looks like a hard fiberglass head, but it’s made of a unique Sofolex SOFT FOAM SAFETY HEAD. Saddle up, put on your cowboy hat and bring the stampede to your party by renting our bull today! So, mechanical bull rental Hamptons, party planners, private parties, western theme party ,corporate event party, Weddings, Schools, Birthdays, Television and Studio shows, Bat& Bar Mitzvahs, Fairs and Festivals, planning tipsideas,Corporate entertainment and amusements, Graduation party planning ideas and any event. GENERATORS PLEASE NOTE: THE USE OF PORTABLE GENERATORS TO POWER THE MACHINE CAN DAMAGE THE ELECTRONICS. We have heard way too many stories from people that got on a mechanical bull rental and the operator was a jerk and threw them before they were even seated. Or, of course there are the stories of the operators that do this to the guys and slow the bull WAY DOWN for the girls. Either way, the rider had a horrible experience, and we just don’t understand this type of mechanical bull operation. THESE OPERATORS ARE NOT PART OF OUR BUSINESS!. This type of mechanical bull operation just doesn’t fly with us. We feel that the rider’s experience and safety are the most important elements. We want riders to EXPERIENCE the thrill of the ride on the mechanical bull and look good doing it. We don’t want tempers flaring with beer muscles. For this reason, Jump And Slide Inc has a NO THROW policy. This means that we don’t throw you off the minute you get on, or try to intentionally throw you off before you can have the experience of the ride. People do get bucked off the bull, but it is in a controlled and safe environment. Rider safety, along with the experience, is the utmost objectives of a mechanical bull operator. We learned that the safest ride is one that comes with education, so operators provide safety and riding tips. A rider that acquires knowledge and experiences a fun, safe ride will return to ride again. We require a flat clean dry space fee from any sharp objects 20’ x 20’ with a ceiling height of 10’ We require an electrical power supply which has 20 amps at 110 volts single phase within 25 feet of where the ride will be situated. If the event is in a club /bar or college campus we will require a minimum of one security personnel. All participants take part entirely at their own risk; it is your responsibility to ensure that your guests/patrons are fully aware of this. The hirer is responsible for any damage done to the hired equipment whilst in their possession/location The hirer agrees to indemnify the artist, company and their employees against any injury or damage caused to person or persons whilst the equipment/activity is at their premises/location. If the event is outdoors we reserve the right to close down the event if our operators feel that is unsafe to continue for any reason whatsoever; the operator’s decision is ALWAYS FINAL. You can rent a Tent from us to cover your bull rental. In case of any unexpected weather. Tents are also great to keep the riders cool from the sun beating down on them. 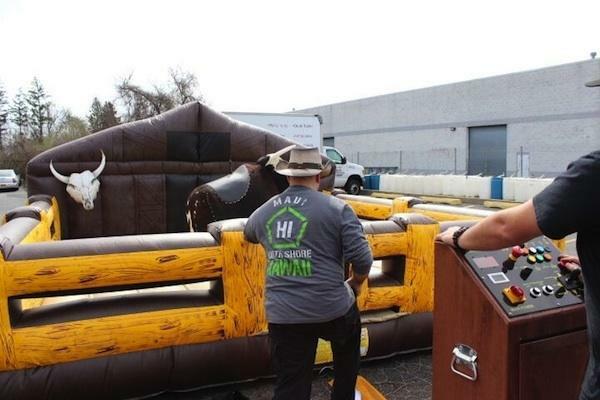 Rent a Mechanical Bull All of our mechanical bulls carry commercial general liability insurance at a minimum of $1M per occurrence and $2M aggregate. We make no exceptions. Additionally insured certificates are available upon request.